If it takes a village to raise a child, it takes a city to build an entertainment complex the size and scope of Act II STAGES. The dedication of the management and staff, and their shared vision of what STAGES brings to Puerto Vallarta, is evident everyday, all year-round, in the quality entertainment Act II provides for both expats and nationals. ACT II's performance complex, STAGES, conveniently located on Vallarta's South side, houses three entertainment venues: 'The Main Stage,' a 160 seat theater; 'The Red Room,' a 100-seat cabaret; and 'Encore,' a 60-seat piano bar. 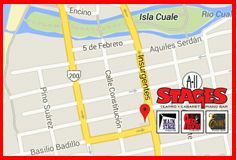 In short, Act II STAGES brings the highest level of diversion to Puerto Vallarta. Come out and enjoy a complete evening of world-class entertainment in any one of their three venues, along with delicious drinks and snacks, all in one beautiful, convenient location. Tickets to all shows can be purchased online at actiientertainment.com, at the box office, which opens daily at 10:00 am, or at the 2nd Box Office location, across the street from Garbos on Pulpito Street in the Romantic Zone. The Act II Entertainment STAGES complex is located at Insurgentes #300 and the corner of Basilio Badillo on the South side of Puerto Vallarta. For more information, call (322) 222-1512, visit their website, or follow Act II on Facebook to stay up to date with information on upcoming productions. Singing sensation Paul Fracassi has returned to Puerto Vallarta this month for a limited run of his hit show 'Walk like a Man,' an exciting tribute to the legendary New Jersey-based recording stars Frankie Valli and The Four Seasons, in The Red Room at Act II Entertainment Stages. March Madness: It's Still 'High Season' at Act II Stages! And The Hits Keep Marching On at Act II Stages! As we head into mid-March, the hits keep 'marching on' at Act II Stages - THE PLACE to go for the best in live cabaret, music, stage plays and drag shows. Here's a look at this week's lineup, which includes the return of Paul Fracassi & the world-premiere of The Kinsey Sicks' new show! Even though the Puerto Vallarta 'high' season will soon start winding down, Act II Entertainment is still in 'high' gear with two new shows opening in The Red Room this month, and three of the winter season's most successful Main Stage shows extended through April due to popular demand. 'Gabelicious' was discussed as a possible title for Gabe Arcineaga's new show at Act II, 'The Gabest Show on Earth, 2.0.' Filled with beautiful music, poignant stories, incredible comedy and exuberant dancing, Puerto Vallarta audiences can't get enough of this must-see show! Act II STAGES, the largest and best entertainment destination in Puerto Vallarta, breaks last year's records mid-month and announces the return of 'Avenue Q' for Pride Month! Here's a look at the exciting lineup of live cabaret, stage plays, and drag shows playing at Stages this week. Act II Entertainment Makes February Fantastically Fun! Puerto Vallarta has become an 'entertainment destination,' and Act II is THE PLACE to go for the best in live cabaret, music, comedy, stage plays and drag shows. Here's a look at what's happening at Stages this week, including 'Avenue Q' auditions and two new shows opening! If you love live music and theater, there's no better place to go in Puerto Vallarta than Act II, where superstars and rising stars will entertain you every night. Here's a look at the exciting lineup of live cabaret, stage plays, and drag shows playing at Stages this week. Act II continues to enthrall audiences with its exciting lineup of entertainment, but one show in particular is taking Puerto Vallarta by storm! 'Little Shop of Horrors,' the must-see show of the season, has been extended by popular demand. Now playing Mondays & Thursdays at 7:00 pm. Act II is celebrating their best season of entertainment yet and, with four star-studded shows opening this month and Nunsense, A-Men! performances lending a helping hand to the Banderas Bay Womens Shelter, Puerto Vallarta can look forward to a Fabulous February at STAGES! Act II Entertains Puerto Vallarta - Seven Nights a Week! Puerto Vallarta has recently become an 'entertainment destination,' and Act II is THE PLACE to go for the best in live cabaret, music, comedy, stage plays and drag shows - seven nights a week! Here's a look at what Stages has planned to keep you entertained this week. Act II is in Full Swing at the Height of the Season! As the only 5-Star venue in Puerto Vallarta, Act II Entertainment is celebrating its biggest and best season ever! A record-breaking box office made 2018 its best year ever, and 2019 is already showing signs it will be better, with sold out houses and new shows opening every week. Directed by Danny Mininni, Act II Entertainment's newest show, 'The Foreigner,' is a huge success! Everyone in the audience was thrilled with Saturday night's opener! Funny, fabulous, fiery, flawless, and filled with laughs, if you are in Puerto Vallarta, this a show not to be missed! Act II Stages closed the year with more sold-out shows than ever in its history! And it's no wonder given that this season's lineup of entertainment features the best in live cabaret, music, comedy, stage plays and drag shows, not to mention new acts opening most every week! The dynamic duo, Emmy Award Winner, Chi Chi Rones, and New York Times acclaimed impressionist, Jo Anna, opened an All New Dueling Drag Divas Show in Puerto Vallarta on January 2. They'll be featured every Sunday and Wednesday at 9:30 pm in The Red Room at Act II Stages. With the return of Sutton Lee Seymour, 'Dueling Drag Divas' & 'Divariety,' and Act II Entertainment's own Danny Mininni directing the play that kick-started the local entertainment scene - all during the first week of 2019 - it's going to be a very Happy New Year in Puerto Vallarta! Now in her second year as a Headliner in The Red Room Cabaret, Diana Villamonte has just won First Runner-Up in the singing competition, 'La Voz,' televised across Mexico. Join Act II Entertainment in welcoming her back to Puerto Vallarta on Friday, December 28 at 5:00 pm. Want your holidays to be filled with laughter and good cheer? Then head over to the south side of Puerto Vallarta, where Act II Entertainment is making the holidays shine brighter with a dazzling lineup of internationally famous stars and blockbuster shows that will fill your holidays with delight and good cheer. If you love live music and theater, there's no better place to go in Puerto Vallarta than Act II, where superstars and rising stars will entertain you every night. Here's a look at this week's lineup, and some exciting news about Act II star, Diana Villamonte. As the only 5-Star venue in Puerto Vallarta, Act II is celebrating its biggest and best season ever! 'Little Shop of Horrors', 'Nunsense A-Men', 'Twist & Shout,' and 'Cinderella, The Musical' are getting rave reviews - and two new shows are opening this week! November at Act II Stages Exceeded All Expectations! Between all-new shows and the return of audience favorites, Act II continues to 'Rock' Puerto Vallarta with the best season of entertainment that this town has ever seen! And the hits just keep on coming at STAGES, where you can enjoy live entertainment every night of the week. Puerto Vallarta has recently become an 'entertainment destination,' and Act II is THE PLACE to go for the best in live cabaret, music, comedy, stage plays and drag shows. Here's a look at what Stages has planned to keep you entertained this week, including the opening of two new shows! Entertainment season is in full swing at Act II STAGES, with many sold-out shows and more new shows opening this week! Ranked #2 on TripAdvisor's list of 'Things to Do in Puerto Vallarta,' great reviews keep pouring in, and audiences are thrilled with the calibre of this year's shows. Now celebrating its 6th season of entertaining Vallarta, Act II STAGES continues to bring you The Best of The Best entertainment in the Banderas Bay area. The five shows that have already opened this season are getting rave reviews - and four new shows are opening this week! Recently named the 'Best Performing Arts Venue in Banderas Bay' by Vallarta Tribune readers, and now ranked #2 on Trip Advisor's list of the 'Best Places in Puerto Vallarta,' Act II continues to enthrall audiences with its exciting new season of entertainment. Kicking off October 31st, the 2018-2019 season of entertainment at Act II offers something for everyone. Whether it's the high-quality theater productions, or internationally-known cabaret acts & drag shows, the incredible entertainment at Stages is on par with any theater in North America. Act II is delighted to announce the lineup for its 2018-2019 season of entertainment. This year promises to be the BEST EVER, with nine productions on The Main Stage, and the return of many of Vallarta's favorite performers, as well as some exciting new faces, in The Red Room. There's always something going on at Act II STAGES. Cool Summer fun can be had every Wednesday night with a 2x1 Happy Hour starting at 6:00 pm, followed by Bob's Karaoke Party at 8:00 pm. Meanwhile, the Act II team is busy getting everything ready for an exciting 2018-2019 season! Between rehearsals, costume and set designs for the exciting shows on its Main Stage schedule, Act II is going 'full speed ahead' to get everything ready for its amazing 2018-2019 season. But, somehow, they still manage to throw the best karaoke party in Puerto Vallarta every Wednesday. The #1 band in Puerto Vallarta, Us Two, will give their last summer performance at Act II on July 25. But don't worry, they'll be back next season with two shows, and 2018-2019 season passes are now on sale! After the show, stick around for Bob's Karaoke Party, the most fun you'll have all week!